Otoplasty surgery is normally performed on young patients who fall under the age group of five to 14 years. The ear is fully matured by the time an individual is four years old and early ear surgery on deformed, misshapen, or prominent ears can save a child the trauma of social ridicule and teasing. Otoplasty surgery can be easily done at a younger age as the ear will be extremely malleable. Several adults opt for ear surgery otoplasty too as it is perfectly safe and produces satisfactory results in adults. 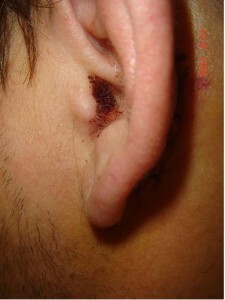 However, the pain level post otoplasty surgery may be higher as the nerves to the ear are more developed in adults. Prior to ear reconstruction surgery or ear pinning, the surgeon will have a discussion with you regarding the goals of the surgery. This pre-operative session is normally done to temper patient expectations about the cosmetic impact of the surgery. The surgeon will warn you that the procedure is unlikely to result in a perfectly symmetrical pair of ears – this is rarely seen even in normal patients. Otoplasty surgery is done on an out-patient basis and adults undergoing ear surgery otoplasty are given local anesthesia. However, young patients are given general anesthesia.